One of the best additions ever made to the Universal Studios theme parks was The Wizarding World of Harry Potter. Both Universal Studios Hollywood and Universal Orlando have areas dedicated to the Boy Who Lived. The Wizarding World of Harry Potter is an immersive experience so that once fans step foot into the land, they will feel like they have stepped into the movies and books. Universal Orlando has two Harry Potter themed lands: Diagon Alley and Hogsmeade. Hogsmeade is located in Universal’s Islands of Adventure and Diagon Alley in Universal Studios Florida. The Hogwarts Express connects both of these Harry Potter themed lands- you will need a Park-to-Park ticket in order to ride though since it transports you between the two main theme parks at Universal Orlando. Universal Studios Hollywood only has Hogsmeade but with a larger amount of shops to compensate for Hogsmeade being the main focus. Universal Studios Hollywood is a working studio and doesn’t have the same capacity as Orlando to expand. Despite that, the experience of Hogsmeade at Universal Studios Hollywood is just as amazing and immersive as its counterpart in Florida. Our guide covers everything you need to know about The Wizarding World of Harry Potter in both the locations in California at Universal Studios Hollywood and in Florida at Universal Orlando. From British dining options to magical rides to the castle of Hogwarts guests can partake in their own Harry Potter themed adventure. Both Universal Studios Hollywood and Universal Orlando have fantastic Harry Potter themed attractions for guests to experience. These rides are extremely popular so we recommend going to these first thing in the morning as the lands typically fill up by the afternoon. The Wizarding World of Harry Potter at Universal Studios Hollywood has two themed attractions. Harry Potter and the Forbidden Journey is the main stop attraction at this theme park. The queue to lead to this ride is an experience in itself as it winds its way through Hogwarts where you will past Dumbledore’s office, a classroom featuring projections of Harry, Hermione, and Ron, the Fat Lady, the vials holding the house points, the Herbology garden, and more! The attraction takes you on a journey following Harry Potter and his friends using a combination of screen technology and classic dark ride technology. The ride uses a robotic arm to transport guests on a bench that becomes magicked to fly by Hermione herself. The harness goes above your head, strapping you in, and leaving your feet dangling as you fly around Hogwarts and the Forbidden Forest. The ride does not go upside down although you do get shaken around quite a bit backwards and forwards. It’s a fantastic ride- not to be missed! Must be 48 inches to ride. Flight of the Hippogriff is the second ride you can find directly across from Hogwarts castle. This ride will take you on a spin through Hagrid’s pumpkin patch. You’ll pass by an animatronic Buckbeak the hippogriff and Hagrid’s hut on your way to board the ride. This family friendly roller coaster spins and dives around Hagrid’s pumpkin patch giving great views of the nearby Hogwarts castle. This is a short ride and a great starter coaster for small children. Must be 39 inches tall to ride. The Wizarding World at Universal Orlando is split into two lands in both of the theme parks. Diagon Alley is found in Universal Studios Florida and Hogsmeade is in Universal’s Islands of Adventure. The Hogwarts Express connects the two theme parks. Combined between both lands Universal Orlando has four attractions with one more set to open on June 13th 2019. Harry Potter and the Escape from Gringotts can be found in the Diagon Alley portion of The Wizarding World of Harry Potter at Universal Orlando. Guests will enter the Gringotts bank underneath the fire-breathing dragon in Diagon Alley. The queue on the way to the ride takes you through the bank’s marble lobby where you can see the Gringotts goblins hard at work. The ride puts the guest in the role of having to escape the bank’s strictest security measures. You will see Harry, Ron, and Hermione along the way along with some more sinister villians like Voldemort and Bellatrix. This is a 3-D/4-D track ride experience and guests must be 42 inches to ride. Hogwarts Express is the transportation that takes you back and forth between the two Universal Orlando theme parks. If you want to experience the Hogwarts Express, you need to have a park-to-park ticket since this is the transportation between the two theme parks. Catch your train in King’s Cross Station and be sure to watch out the windows to see scenes reminiscent of the Harry Potter movies. Universal’s Island’s of Adventure is home to both Flight of the Hippogriff and Harry Potter and the Forbidden Journey. Both of these rides are nearly identical to their Universal Studios Hollywood counterparts. The minimum height for Harry Potter and the Forbidden journey is 48 inches and 38 inches for the Flight of the Hippogriff. The newest ride that will open June 13th 2019, Hagrid’s Magical Creatures Motorbike Adventure, is also located in Universal’s Islands of Adventure. This new ride takes guests into the Forbidden Forest and beyond the grounds of Hogwarts castle twisting past trees, magical creatures, and encountering pits of Devil’s Snare. This freewheeling coaster is led by Hagrid and has been advertised as a thrill ride. The new ride opens June 13th 2019! Hogsmeade is the only land featured in Universal Studios Hollywood and is also featured in Universal Orlando. Both of these lands are nearly identical as they both closely mirror the Harry Potter movies. For example, you will see the same dining and shopping options in both parks with only a little variation. The main dining option in Hogsmeade is the Three Broomsticks which succeeds as being nearly identical in offered dishes and atmosphere as we saw in the Harry Potter movies and books. You can find Butterbeer here along with classic English dishes like fish & chips, shepard’s pie, and dishes mentioned during the ‘Great Feast’ in the Harry Potter books. At the back of the Three Broomsticks, you can find Hogs Head for a drink of Butterbeer or some brews for the adult wizards. You can also find Butterbeer and other snack/drink options at Magic Neep Cart on the way to Hogwarts castle. Check out Universal Hollywood’s dining site for menu information for the Wizarding World of Harry Potter here and Universal Orlando’s here. You will find all the mentioned stores that Harry, Ron, and Hermione visited in Hogsmeade during their weekends off from school here. Click here more information on shopping options at Universal Studios Hollywood’s Hogsmeade. The entertainment options are also similar in both the Hogsmeade locations! Ollivanders– this is where you can find your wand! After all, the wand chooses the wizard! 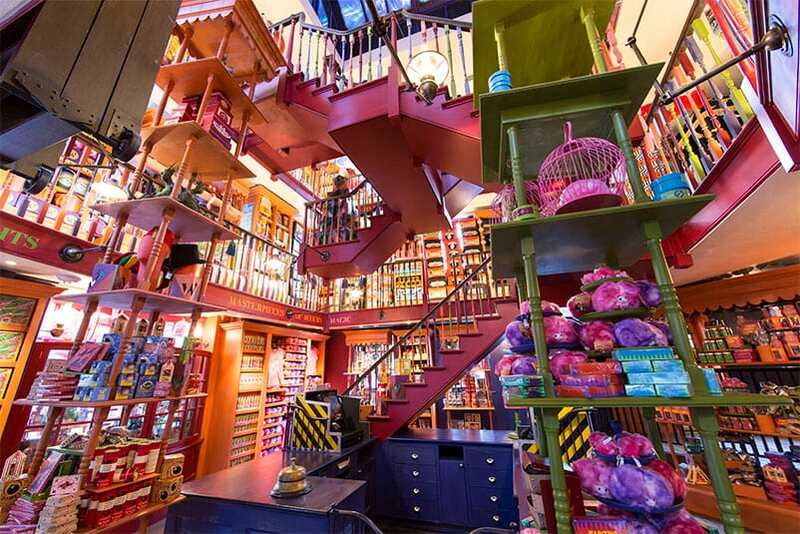 This shop includes an experience similar to the one shown in the Harry Potter movies as one lucky guest will be chosen from each set of guests let into the store to be the one to wield the wand. Make sure to go here first in the morning if this is on your list as this experience is quite popular and the line fills up fast. Frog Choir- listen to the vocal songs from the Hogwarts frogs! Twizard Spirit Rally- see a cool demonstration from Beauxbatons, and Durmstrang in a rally to get spirits ready for the Twizard Tournament. 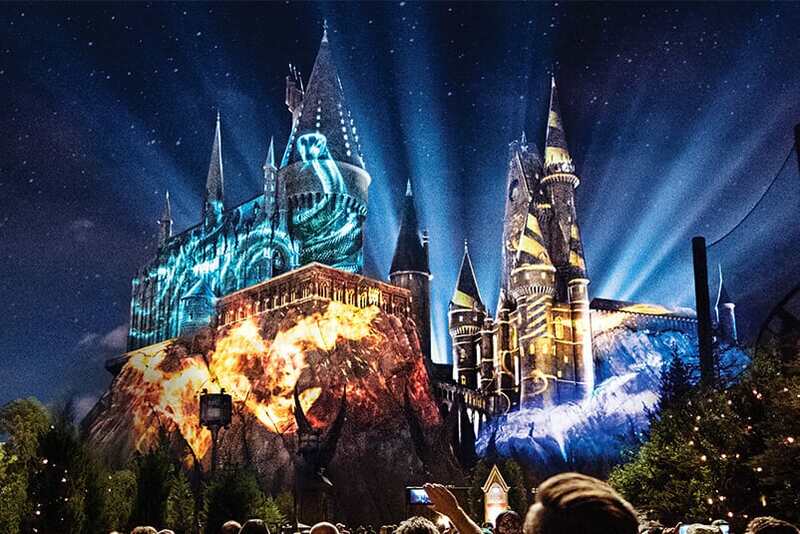 There is more variety with the night time shows at the Hogsmeade locations at Universal Studios Hollywood and Universal Orlando so it’s a good idea to check the calendar for each site before your visit. The Nighttime Lights at Hogwarts Castle- this projection show on Hogwarts castle is a celebration of the four houses of Hogwarts: Gryffindor, Ravenclaw, Hufflepuff, and Slytherin. This show is currently the night time show at Universal Studios Florida. Dark Arts at Hogwarts Castle- this NEW show premiers April 13th at Universal Studios Hollywood. 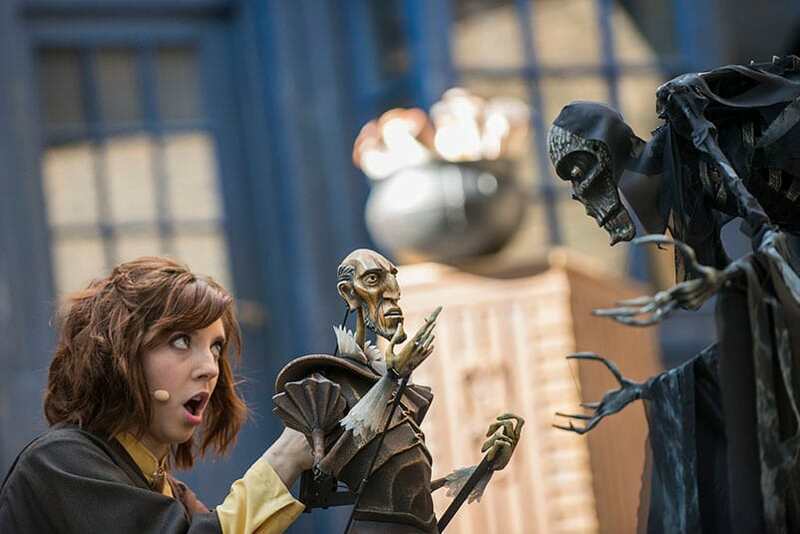 The show features Dementors, Death Eaters, and other creatures associated with dark magic. This projection show, like other evening shows in Hogsmeade, is shown on Hogwarts castle. This show will play at Universal Studios Hollywood April 13-28 and May 25-27. The Magic of Christmas at Hogwarts Castle shows during the holiday season at both Hogsmeade locations. The Magic of Christmas at Hogwarts Castle- this projection show on Hogwarts castle only happens during the holiday season at the Christmas in the Wizarding World of Harry Potter celebration which typically takes place on select dates in November-January. To read more about Christmas at the Wizarding World of Harry Potter click here for the Universal Studios Hollywood guide and here for the Universal Orlando guide. Diagon Alley is only found at Universal Orlando in the Universal Studios Florida theme park. The Hogwarts Express connects both Diagon Alley and Hogsmeade- a definite must for Harry Potter fans. There is a greater variety of dining options in Diagon Alley including sit down restaurants, places to get drinks, and desserts all themed to match the Diagon Alley of the movies and books. Eternelle’s Elixir of Refreshment– this beverage kiosk has the Gillywater mentioned in the books along with other drinks that bubble and change colors. Florean Fortescue’s Ice-Cream Parlour- this is the ice-cream parlour where Harry worked on his homework in the books and offers a large variety of ice-cream flavors like Butterbeer, earl gray, lavender along with more classic options. Leaky Cauldron- the main dining restaurant in Diagon Alley has traditional British food like fisherman’s pie, bangers and mash, and more. The Fountain of Fair Fortune- this drinking stop features non-alcoholic drinks like Butterbeer and Pumpkin juice along with alcoholic drinks like beer and cocktails. The Hopping Pot- this walk up counter has Butterbeer, frozen Butterbeer, Pumpkin Juice, and other frozen drink options. Click here to read more about the dining options at Diagon Alley in Universal Studios Florida. The shopping options in Diagon Alley feature classic stores from the books and movies that all offer souvenirs that assist guests in fully immersing themselves in the Harry Potter franchise. To read more about the merchandise you can buy in Diagon Alley, check out Universal Studios Florida’s website here. Diagon Alley has a variety of entertainment experiences for guests to enjoy throughout the day. Celestina Warbeck and the Banshees- listen to Molly Weasley’s favorite singer, Celestina Warbeck, and sing along to ‘A Cauldron Full Of Hot, Strong Love’, and ‘You Charmed The Heart Right Out Of Me’. Gringotts Money Exchange- exchange your U.S. currency for Gringotts bank notes with a Gringotts goblin in $10 or $20 denominations that can be used for purchases in Diagon Alley and Hogsmeade. Knight Bus- parked in Diagon Alley is the well-known purple triple-decker that transports stranded witches and wizards. Take a look inside to see what it looks like! Ollivanders- this is where you can find your wand! After all, the wand chooses the wizard! 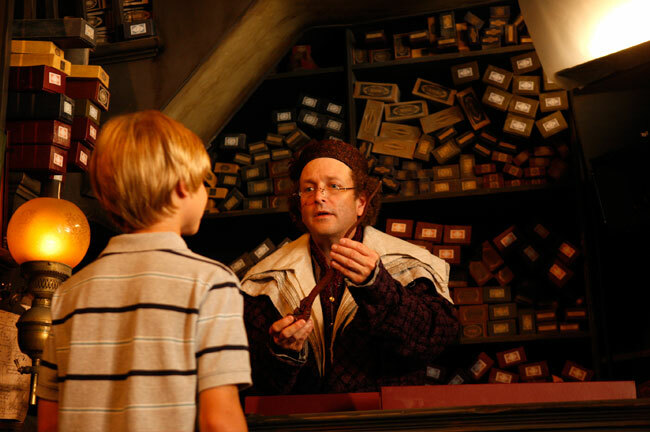 This shop includes an experience similar to the one shown in the Harry Potter movies as one lucky guest will be chosen from each set of guests let into the store to be the one to wield the wand. Make sure to go here first in the morning if this is on your list as this experience is quite popular and the line fills up fast. Christmas at the Wizarding World of Harry Potter offers many breathtaking sights to see that transport you right to the holiday celebrations in the movies and books. The Magic of Christmas at Hogwarts Castle features classic Christmas scenes from the books like the grand Christmas trees in Hogwarts Hall and the Yule Ball. This past year the addition of nightly snowfall was added to Hogsmeade making the experience even more magical. 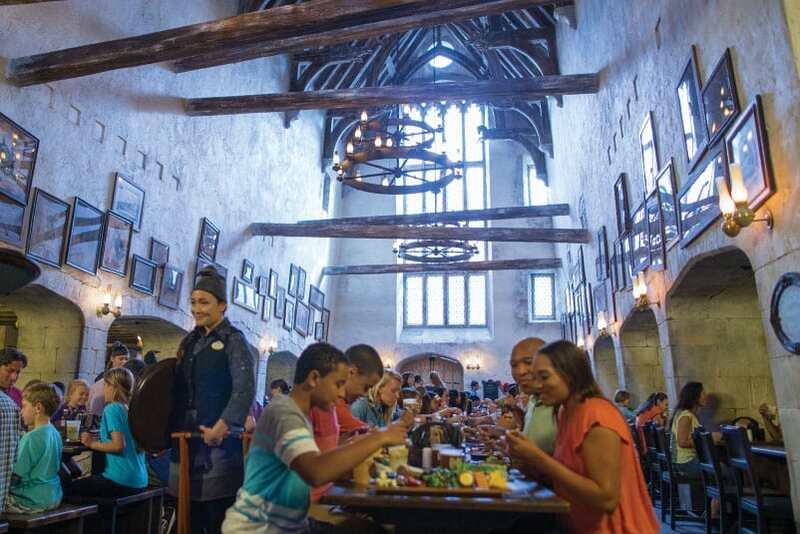 Guests can also enjoy traditional holiday food straight from the pages of Harry Potter and enjoy seeing Hogsmeade and Diagon Alley decorated to the max with snow-capped roofs and all the holiday trimmings. Click here to read all about Christmas at the Wizarding World of Harry Potter at Universal Studios Hollywood! Click here to read all about Christmas at the Wizarding World of Harry Potter at Universal Orlando! Plan Your Vacation to the Wizarding World of Harry Potter! Don’t forget to sign up for our discount newsletter so you have access to deals from our travel partners offered exclusively to our subscribers!